It is May 3rd, 1941. Just as the sun peeks over the horizon on that cold spring morning, a harrowing report comes in to the sheriff's department. The mayor has been murdered in his home. Solve the murder/Clear your father's name. Two wills struggle on separate paths towards the same goal, to find out what really happened. Who killed mayor James Scott? Play as detective Francis Dale and as the murder suspect's son Gabriel Heinrich in this short point and click adventure game. Featuring rich, detailed pixel artwork and animation and an old-school inspired soundtrack, with a few modern design conveniences. (No incessant saving-dying-loading!) 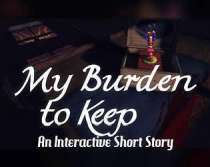 Features: An interactive short story. A bite-sized adventure that you can finish in about 40-60 minutes; Rich and detailed pixel artwork and animations; Old-school inspired soundtrack; A story that follows two perspectives; Interrogate and search for clues and evidence as Francis; Find a way to prove your father's innocence as Gabriel; Simple point-and-click controls; Left mouse button to execute action/choose dialogue option; Right mouse button to cycle between verbs (i.e. Walk To, Examine, Interact, Talk to); Includes full soundtrack - 12 Tracks, available in WAV, OGG and FLAC formats.